The popular image of multi-culturalism as a mosaic, a salad bowl in which different cultures mix but keep their integrity, is misleading. Cultures are more like soups, flavored with many ingredients, some identifiable. –From the book ‘Cultures and societies in a changing world,’ written by Wendy Griswold. Taiwan has a long history of diasporas and colonization. Even the so-called ‘aboriginal people’ in Taiwan drifted there several thousands years ago. About four hundreds years ago, many Han Chinese from China migrated to Taiwan and changed the aboriginal culture. For example, Siraya, one group of the aboriginal people, has its own religion, A-Li-Tsu. The historied religious building is very simple. After sinicization, their religious buildings look more like the religious buildings for Groundskeeper God in Han’s culture. Japan had colonized Taiwan from 1895 to the end of WWII. 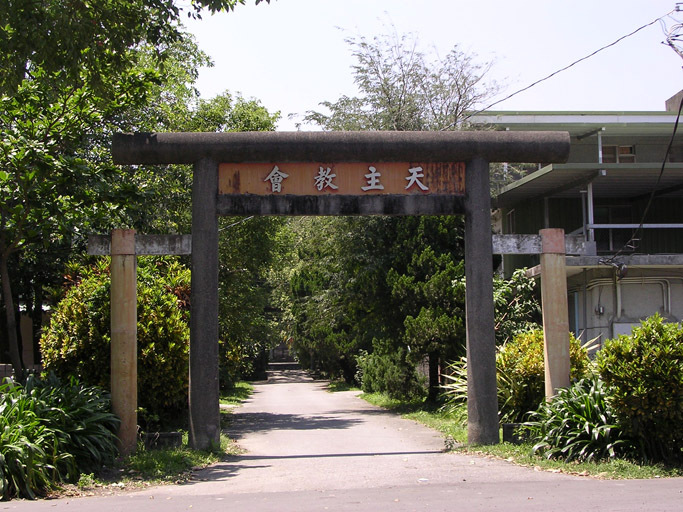 In 1949, the government of Republic of China lost its former territory following the Chinese civil war and moved to Taiwan. Therefore, it is not surprising that we can saw Japanese-style Buddha statue in a Han’s religious building (photo # 1), which was rebuilt after 1949. In the 17th century, the Spanish and Dutch ruled Taiwan shortly, and the exposure to the western culture seems to influence the decorations in traditional Han’s religious building–the sculpture in photo # 2 shows a western man wearing a suit in a Han's temple. The Spanish and Dutch also brought Christianity to Taiwan, and Christianity is one of the major religions in Taiwan. Photo # 3 shows a church with Torii, a traditional Japanese gate commonly found at the entry of to a Shinto shrine. There is another flavor added to the religious buildings in Taiwan: modern. Decades ago, some fishermen picked up several damaged god statues and set up a temple for them. However, where they set up this temple became a park and the government asked them to move the temple. Because they do not have other place to set up the temple, they can only move the temple when the policemen came. At the end, the government decided to let the temple stay, but due to the possibility of flooding, the temple is designed to be able to be raised up when needed (along the four pillars around the temple). After reading this article, do you think multi-culturalism observed in Taiwan is a salad bowl or soups? I think multiculturalism is a flawed, superficial notion; I believe the significance of culture is not in things, but in values assigned to things, in how people interact with things, and in how people make things their own. Perhaps these diffused elements observed in Taiwanese religious buildings were a way to make peace with or find familiarity in new, foreign things. I find no use in comparing culture to soup — it is far too complex a beast.